St Peter’s Church was built as a result of a competition in 1824 to design a new chapel on the Steine. There was an acute shortage of churches at the time. Six years earlier there had been only two Brighton churches for 18,000 inhabitants! St Peter’s was built of Portland stone in the Perpendicular Gothic style. Its tower was designed to provide an impressive end-piece at the north of the Steine. In 1873 St Peter’s became the Parish Church of Brighton. The church hall next to it was built in 1927 as a memorial to those killed in the First World War. St Peter’s church was built in 1824-28 as a chapel of ease to St Nicholas. It was designed in the gothic revival style by Charles Barry (later to be the architect of the Houses of Parliament) who had won the design competition. In 1873 it became the parish church of Brighton replacing St Nicholas, when due to expansion the town was divided into several district parishes. Built of Portland stone, it has not weathered well and now requires extensive and expensive renovation. A chancel by George Somers Clarke was added in 1906. Built of sandstone it is of a different colour to the original stonework. Although I am an aetheist, I nevertheless condemn any suggestions to demolish this impressive and historic building. During my thirty-something years in the area, I have always seen St Peter’s as being as much a part of Brighton as the Royal Pavilion. Not meaningful perhaps to the casual tourist, but certainly important as a landmark to Brighton dwellers and, I feel sure, rewarding to anyone with the slightest interest in architecture. Far more worth preserving than the much lauded West Pier. And on that inflammatory note, I leave, wishing more power to your elbow. 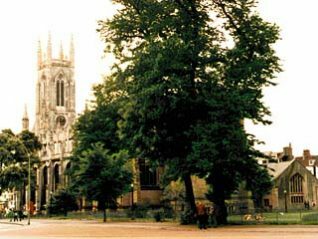 In February 2007 it was announced that St Peter’s Church is expected to shut following a recommendation from the Diocesan Pastoral Committee, the Church of England body in charge of churches in the city. The reasons were lack of money and falling congregation numbers. The average Sunday attendance at St Peter’s is only 90 in a church that is capable of holding 2,000.